Gaelscoil na Cruaiche, Westport, are presented with a plaque by An Taoiseach Enda Kenny in recognition of being the first school in Ireland to receive the ISPCC Blue Shield Flag for their ongoing anti-bullying work. Photographed, from left, are: Ashley Balbirnie, ISPCC CEO, An Taoiseach Enda Kenny, principal Mairéad Ní Ruáin, Fiona Jennings, ISPCC West representative, and Sandra Uí Chorcoráin, chairperson of the school’s board of management. Photo: Michael Donnelly. A Westport Gaelscoil has become the first school in Ireland to fly the Blue Shield Flag for its robust anti-bullying policy. An Taoiseach Enda Kenny was in Gaelscoil na Cruaiche yesterday (Thursday ) to raise the Blue Shield Flag, which is an initiative by the ISPCC. The Blue Shield Flag recognises schools who have strong anti-bullying policies and promote a climate of openness and support in responding to any bullying concerns. Some of the measures introduced at Gaelscoil na Cruaiche include an anti-bullying awareness week and appointing an anti-bullying coordinator. 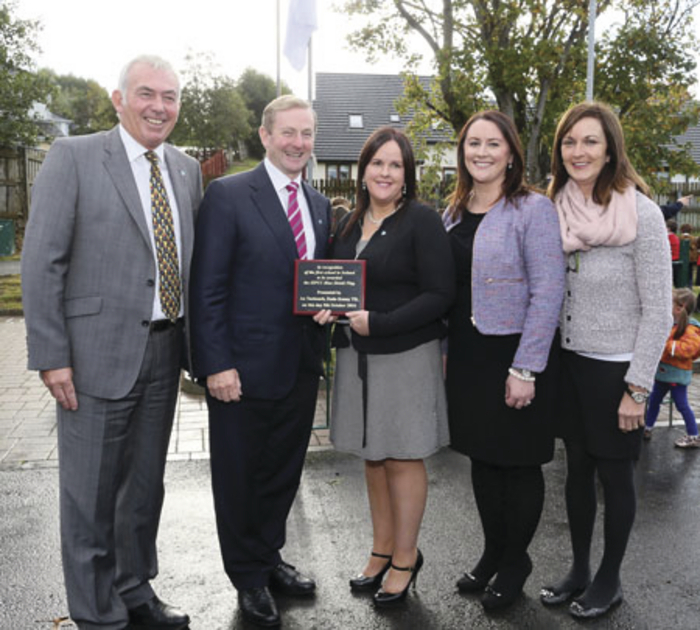 Speaking at the flag raising ceremony, An Taoiseach congratulated the school on their achievement. “The ISPCC Blue Shield Flag is a testament to their positive action and determination to ensure a safe and secure school environment for all children and is a great example for all schools to follow to combat bullying,” he said. Last year the ISPCC worked with 100 schools in reviewing and developing their anti-bullying policies, and it has worked with 71 schools so far this year. Fiona Jenning, regional ISPCC representative, said bullying is a consistent issue that needs to be addressed. For more information on the campaign visit www.ispcc.ie or telephone (01 ) 676 7960.